Foxconn says the plant will create about 1,500 jobs. 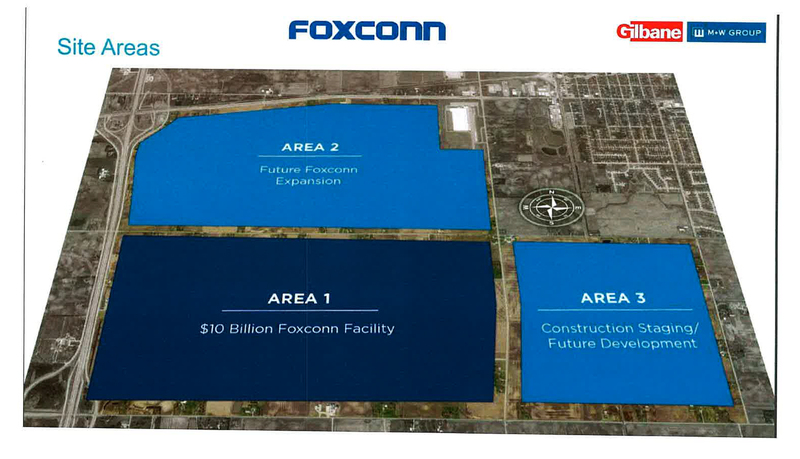 "Our commitment from day one has been to establish a winning formula for Foxconn and for Wisconsin," Louis Woo, special assistant to Foxconn CEO Terry Gou, said in a written statement. "We continue to expand our presence around the state, create jobs and deepen our partnerships while innovating and adapting to meet changing market needs." The future of Foxconn has been questioned by some, particularly after the company briefly changed course earlier this year. The initial Gen 6 facility will manufacture LCD screens for use in a variety of industries including education, health care, entertainment and sports, according to the company. By April 1, Foxconn officials say they will announce contractors for site utilities, roadway and storm drainage projects. By May, the company says it will issue initial bid packages for the construction of the manufacturing facility and ancillary buildings. The announcement comes the same day the Village of Mount Pleasant will hold a Foxconn status meeting to update its residents on the project. That meeting is scheduled for 6 p.m. Monday at the Mount Pleasant Village Hall. Representatives from Gilbane, Foxconn’s general contractor, the state Department of Transportation and Gateway Technical College are expected to attend. "'Wisconsin First' has been our commitment from the start and it has been evidenced in our construction hiring to-date," Woo said in a statement. "It will continue to be our priority as we lay the groundwork for a significant manufacturing presence in Racine County." Gov. Tony Evers said as the project develops, there will be ongoing conversations to ensure Wisconsin taxpayers see a good return on their investment. "The governor has always said that he wants to see jobs and opportunity created in Wisconsin, but that we must protect the people of Wisconsin and use their tax dollars responsibly," said Evers' spokeswoman Melissa Baldauff. "Today’s announcement by Foxconn makes it clear that Gov. Evers is getting results. The governor will continue to make good on his promise to protect the taxpayers by making sure that Foxconn is transparent and accountable as they move forward."